Also known as the striped polecats they are related to badgers and are similarly nocturnal, meaning they only come out at night. 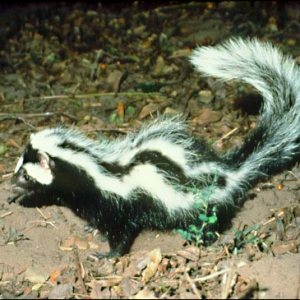 They are one of the smelliest animals in the world and aren’t even very tolerant of other of other Zorillas. They can squirt their enemies with a nasty smelly spray! They also pretend to be dead as a form of defence because they know that predators won’t want to eat a smelly dead thing! Zorillas live in rocky crevices and hunt by night.. The zorilla has thick fur with black and white markings, and a long, bushy tail.